I took a quick walk out at noon to see what was going on around the barnyard. The temperatures climbed to a balmy 36 degrees today. Everyone was just chilling out, enjoying the sunshine. I’m not sure at this point how many ducks I actually have. I went into the winter with somewhere around 15. A few weeks ago one of our neighbors called and said, “Two boys just shot one of your ducks! They’re still out there – if you run out now you can probably catch them.” So Matt ran out and gave them an earful about knowing what they were shooting at. It was one of my favorite drakes, black with a green shimmer to his wings. Matt let the boys keep him because he didn’t feel like cleaning a duck that afternoon. 7 ducks come up into the chicken coop at night. I’m thinking there must be more hanging out along the creek on the neighbor’s side where it’s more sheltered. This weekend I’m going to trek out there and see what I can find out. The chickens hang out in the corn crib / chicken coop. Except for the band of separatists, who have made their home in the cattle shed. They look generally dishevelled this time of year. 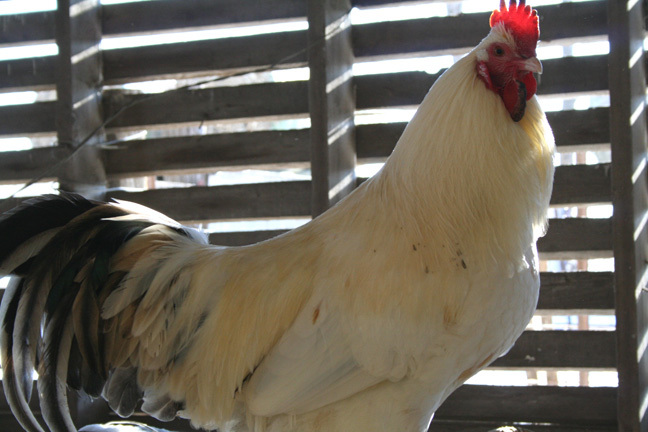 The rooster below is such a handsome boy, the Brad Pitt of the barnyard, even when looking dishevelled. Especially when looking dishevelled. And he has a twin brother. If I was a hen, I’d be swooning. Do your chickens still lay for you this time of year? Just curious. fm – thank you! I’m going to have to try and get a picture of the twin roosters together.susan – I get a couple of eggs a day, if I get out there before they freeze. I’m not sure how many hens I have at this point, haven’t done a head count lately. I’d guess around 35 or 40? 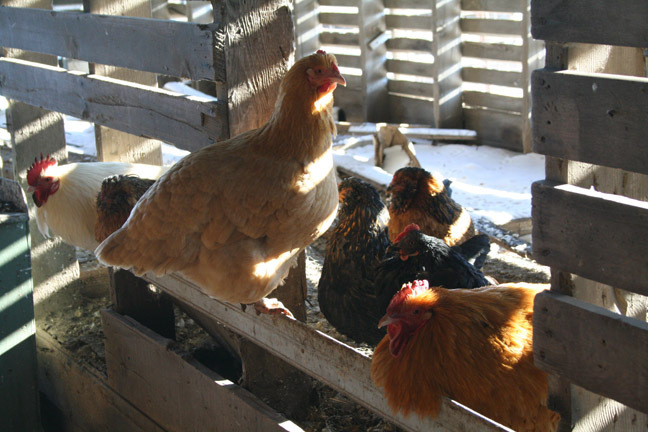 I really need to start a new group, but I’m attached to these old hens and don’t know what to “do” with them. I don’t understand why our ducks are such homebodies. 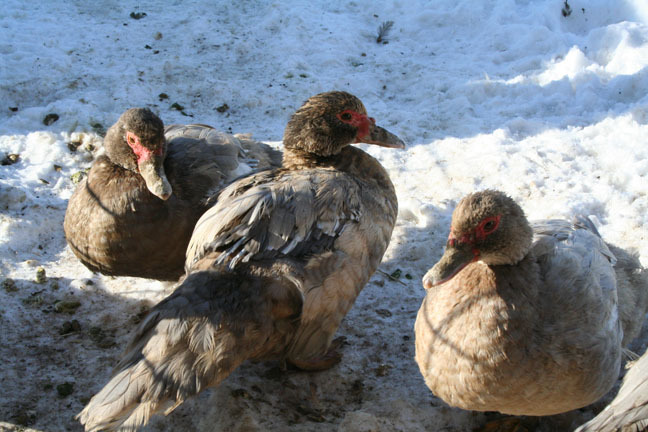 The muscovies especially, do not want to have anything to do with water unless it’s in their wading pool, and even then they don’t get in it much. All our ducks want to do is sit on the shop porch, admiring their reflections in the glass door, and pooping right where I need to walk. Thanks for the link Kelli, I do wish I had a money tree when I see places like that. Check out this one: http://petchhouse.blogspot.com/2007/12/christmas-at-carson-shack.htmlThe movie was good. Tim and I really enjoyed it. Both Cheney and Ellis were there along with the producer so that was cool. They tried to start a discussion about where agriculture was headed, impact, etc, but it was mostly 50+ age farmers in the audience and they really only wanted to talk about what people in the big city thought of them. So that was kind of disapointing. It would be cool to have seen it in a bigger community like Cedar Falls to see what the reaction was there.